Recently, the girls and I enjoyed a show called "Twice Upon a Time." This performance from Austria is one of over 200 free events scheduled in Washington, DC from October 14 - November 10 as part of the Kids Euro Festival. Workshops, performances, and special events are held in many public locations. You can see a full schedule of events at the festival website. What a fantastic way to celebrate the culture of more than 27 European countries! The Maison Francaise at the French Embassy was the venue for this show. 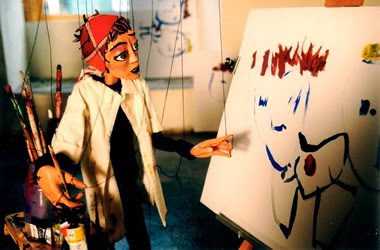 In Twice Upon a Time, the very talented Karin Schäfer and Peter Hauptman delighted the audience with this puppet show that makes you wonder what would happen if someone really were "pulling all the strings." The show was very entertaining and fun to watch. Natalia especially liked the piano playing marionette who really appeared to be playing a masterpiece! Alexia's favorite was the skateboarding teenage marionette. A variety of musical selections set the different moods of the show. The underlying theme and message of the show touched the girls deeply. You can see a clip of the performance here. Take advantage of these unique cultural activities before the festival ends in mid-November! It's such a fantastic opportunity. Of course, Alexia had to blow some bubbles while we were waiting for the show to begin.